Thank you Simply Made Kitchen and Crafts for the recipe. Preheat oven to 350 degrees. Lightly spray an 8×8″ baking pan with non-stick cooking spray. In a mixing bowl, cream butter and brown sugar, set aside. In a medium bowl, mix oats, flour, baking soda, and salt. Mix dry ingredients in to the creamed mixture. Press 1 1/2 cups of the mixture into the bottom of the prepared pan. Spread the jam over this layer. 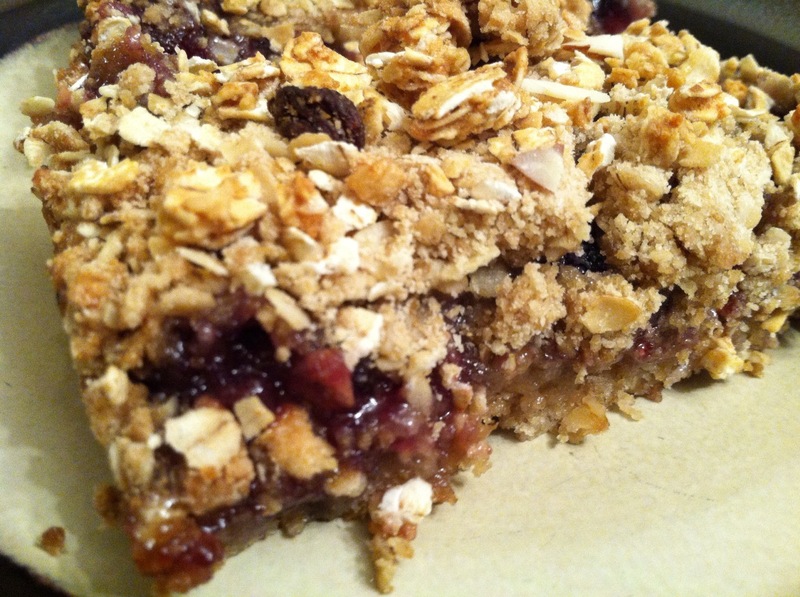 Sprinkle the remaining crumb mixture over the top, and lightly press it into the jam. Lightly sprinkle chopped pecans over the bars. Bake for 25-30 minutes in preheated oven, or until lightly browned. Allow to cool before cutting into bars. My only variation to this recipe was adding one ripe banana to the creamed mixture and using granola instead of chopped pecans. This was a very easy snack to make. This recipe is a keeper. looks delicious! !… I’ll do it!